I won’t be precisely in the cradle of the modern global cooperative movement tomorrow evening, but I will be very close to it. I’ll be in Whitworth, just north of Rochdale, giving a talk in the public library there on nineteenth century productive cooperatives based on my recent book All Our Own Work. The talk is one of a regular series organised by the library manager in Whitworth. All credit to him and to his library service for the initiative. 7pm start, by the way, if you’re anywhere near. I’ve been working this morning on the presentation I’ll be giving in a couple of weeks at the Society for Co-operative Studies’ annual conference, being held in Leicester on September 5th and 6th. I’ve titled my presentation Britain’s early productive cooperatives, why they were forgotten, and why they’re relevant today, although it’s fair to say that my focus will be mainly on one particular cooperative, the fustian mill in Hebden Bridge which was in its day considered one of the exemplars of manufacturing cooperation and which is the subject of my recently published book All Our Own Work. 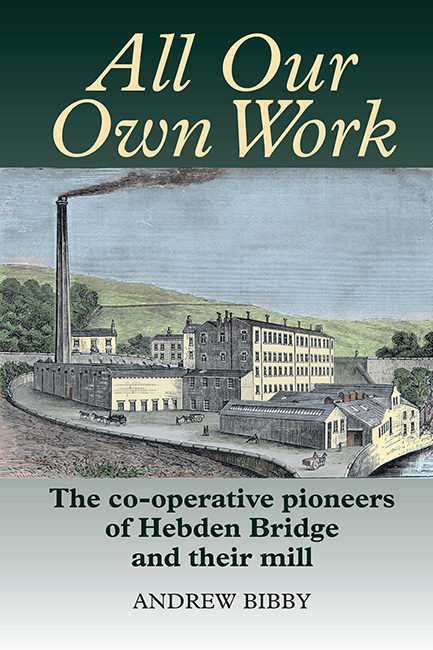 Posted on June 3, 2015 by bibbyoncooperatives Tagged All Our Own Workco-operative historyHebden BridgeRochdale Pioneers Museumworkers cooperatives	CommentsNo Comments on Book launch time! My book All Our Own Work, which tells the story of one of the pioneering nineteenth century ‘productive cooperatives’ (workers’ cooperatives), is published later this month, and will be launched on Friday June 26th at the Co-operative Congress evening reception at Birmingham Town Hall. I hope to see many old friends there. The Hebden Bridge launch takes place the following weekend, on Sunday July 5th at 1pm in the Hebden Bridge Trades Club. All welcome. An exhibition to tie in with the book’s publication is being put on at the Rochdale Pioneers Museum (Toad Lane, Rochdale), and I’ll be there for the launch event on Saturday July 18th at 1pm. So plenty of dates for your diary! More information on my website here. Posted on March 30, 2015 by bibbyoncooperatives Tagged cooperative historyworkers cooperatives	CommentsNo Comments on Coming soon! Cover design for my forthcoming book All Our Own Work has just arrived from the publishers, Merlin Press. Publication is June, by the way. Two separate envelopes through the letterbox here today, both in different ways bearing encouraging news of the health of the cooperative movement. One is the Spring 2015 newsletter of Rootstock, the ‘social investment’ cooperative society which offers withdrawable shares to its members as a means of raising capital to help cooperatives (mainly housing coops) working for social change. Rootstock was set up through the efforts of the Radical Routes network of coops and deserves to be better known. Rootstock investors’ money has since 1991 been used to make sixty loans to coops. Their website gives all the information investors need. Valley Organics is a West Yorkshire based workers’ cooperative running an organic food shop which they purchased two years ago from its previous private owners. Valley Organics’ very attractively produced Annual Report seems to me a model of the sort of way that workers’ coops should share information with their friends and customers, with details of both the business’s financial performance and its ethical policy. The good news is that turnover is 35% up on projections. (“To be perfectly honest, we are a bit surprised to find ourselves running such a successful enterprise!” they say with refreshing candour.) Good for them. A cup of coffee this morning with Cath Muller from Cornerstone housing coop and Footprint Workers Coop in Leeds (well, the coffee was mine, Cath had a much healthier herb tea). Cath reminded me of the work which many of the more progressive workers’ coops in Britain are doing at the moment to build the Worker Cooperative Solidarity Fund, an excellent initiative launched last year based on a vision of “a strong, growing and self-reliant network of successful workers’ co-operatives”. It’s good to see that workers’ coops are getting together, as last year, for another weekend conference, being held in early May. 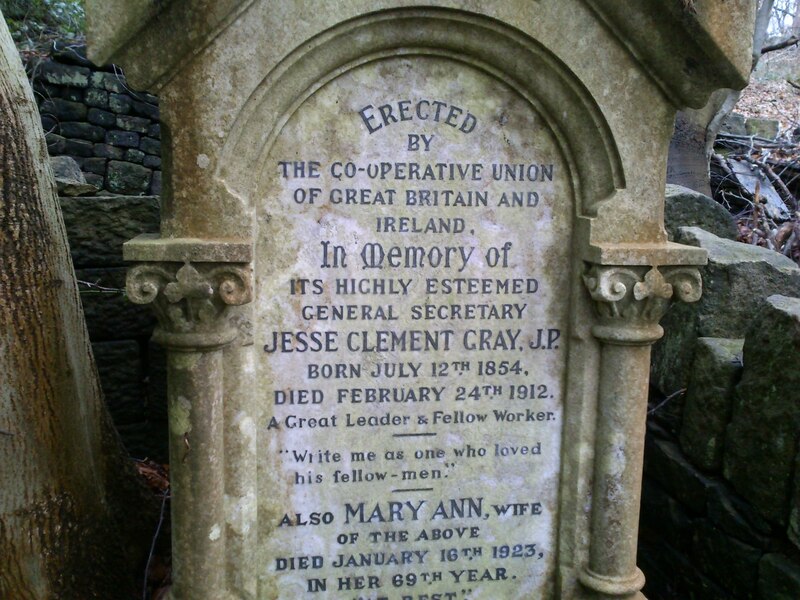 During the fag-end of the later twentieth century when the retail cooperative movement was in dire straits it was the workers’ cooperative part of the movement which provided the energy and creativity. That energy is still needed today. I’m feeling a natural sense of relief here as the manuscript for my forthcoming book All Our Own Work heads off to the publishers, Merlin Press. The book tells the history of one of Britain’s earliest and, at that time, best known productive cooperatives (what we today would call workers’ cooperatives). This was the Hebden Bridge Fustian Manufacturing Co-operative society, which operated successfully from 1870 to 1918. My account explores how the workers who were motivated to run their own textile mill coped with the challenges of managing the business, among these the task of finding the necessary capital. There was also the vexed question of deciding how to share the profits: how much should go to the workers, how much to the investors, and how much to the cooperative societies who were the customers. I’m naturally keen to get the story of this cooperative as widely known as possible, so it’s good to see a related news piece up on the Co-operative News website. The story describes how the graves of Joseph Greenwood and Jesse Gray, two of the leading figures in the Fustian society’s history, have recently been cleared of undergrowth and made much more accessible to visitors. The Co-op News can be found here.